About Us — Main Street Zephyrhills, Inc. Originally known as Abbott, Zephyrhills was originally settled in 1882. With a thriving lumber industry, Abbot quickly grew as the Seaboard Coastline Railroad established a depot in the town. In 1910, Captain Howard B Jeffries, a Union Army Captain in the Civil War, came to the town to construct a retirement community for veterans called the Zephyrhills Colony. It is said that Jeffries named the town after the breezes or "zephyrs" that blew across the countryside. Towards the middle of the century, Zephyrhills saw an influx of tourists and those looking to retire in the Sunshine State. In 1961, Zephyrhills Water Corporation was created to take advantage of the natural springs flowing nearby, hence the name “The City of Pure Water.” Since then, the size and population of the once-small community has increased steadily, businesses and restaurants have flourished and Zephyrhills has become a hub for diversity and prosperity. Main Street Zephyrhills, Inc. is dedicated to providing economic vitality through historic preservation, pride in our quality of life and a strong sense of community. The Main Street Approach can bring about dramatic positive changes in historic downtown Zephyrhills. It encourages economic development within the context of historic preservation. The approach advocates improvement in four areas to create a positive distinctive image downtown. Organization – Working with the public and private sector community leaders to develop consensus and coordinate resources to revitalize downtown. Promotion – Creating and marketing a positive image of downtown through special events, retail sales, effective advertising and public relations. Design – Encouraging quality building rehabilitation, signage, public improvements and window displays to improve downtown appearances. Economic Restructuring – Improving economic base of downtown by strengthening existing business, recruiting new businesses, and filling vacancies. The Main Street Approach also advocates a return to community self reliance and emphasizes the downtown’s traditional assets: personal service, local ownership, unique architecture and a sense of community. “We are proud to acknowledge this year’s 840 nationally accredited Main Street America programs that have worked tirelessly to strengthen their communities. said Patrice Frey, President & CEO of the National Main Street Center. “These programs deserve recognition for generating impressive economic returns, preserving community character, and celebrating local history. Main Street America Accredited communities are part of a powerful movement of change makers, and their dedication to improving quality of life in the places they call home is inspiring. In 2018 alone, Main Street America programs generated $4.93 billion in local reinvestment, helped open 5,310 net new businesses, generated 25,301 net new jobs, catalyzed the rehabilitation of 8,146historic buildings, and clocked 2.2 million volunteer hours. 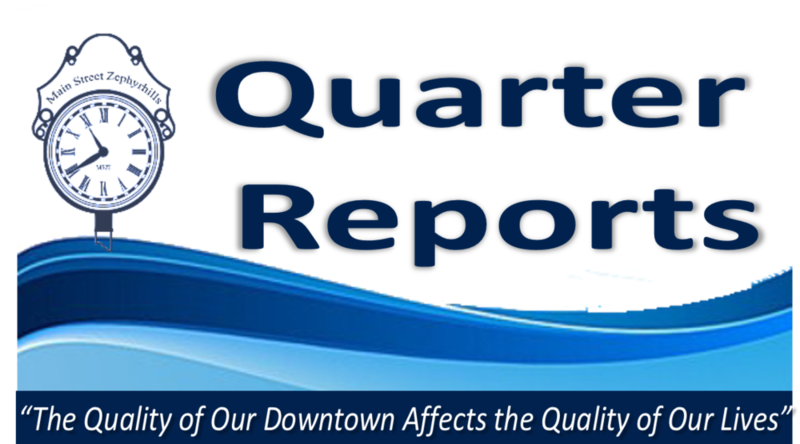 The Main Street Zephyrhills, Inc. performance is annually evaluated by Florida Main Street Program, which works in partnership with the National Main Street Center to identify the local programs that meet ten national performance standards. Evaluation criteria determines the communities that are building comprehensive and sustainable revitalization efforts and include standards such as fostering strong public-private partnerships, documenting programmatic progress, and actively preserving historic buildings. Florida Main Street can be credited with billions of dollars of reinvestment into communities throughout the state. This high level of reinvestment allows programs to create a place for its community members to learn about the past and create new memories for the future.